My parents used to have several examples of unsilvered ornaments dating from the war years. This red ball is the only one that now survives unbroken. No metal was used in its production; its cap is cardboard, its hanger, paper string. The interior lacks a coating of silver nitrate solution that had been standard practice before the war. 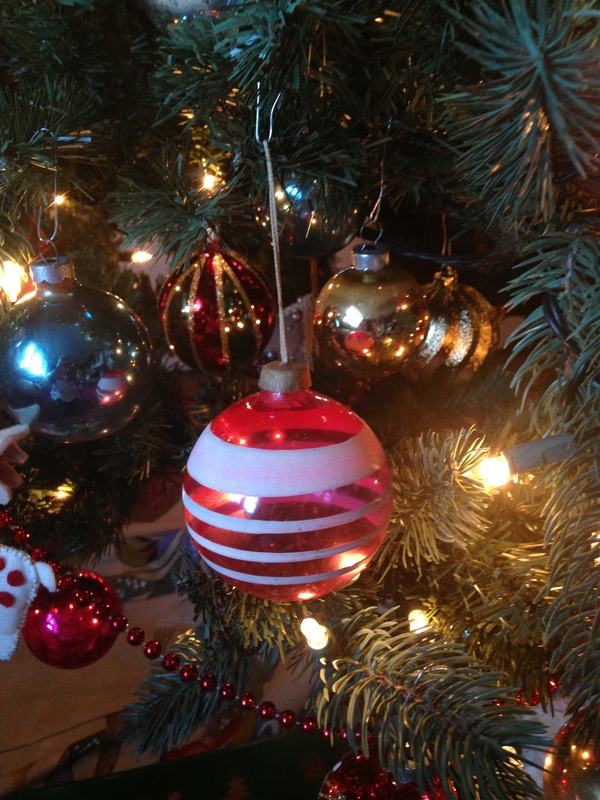 Until the end of the 1930s, any glass ornaments adorning American Christmas trees were hand-blown in Germany and imported. It was evident that the outbreak of World War II would put a stop to this supply. During this time, the Corning Glass Company began producing clear glass globe ornaments, using a machine intended to make light bulbs. 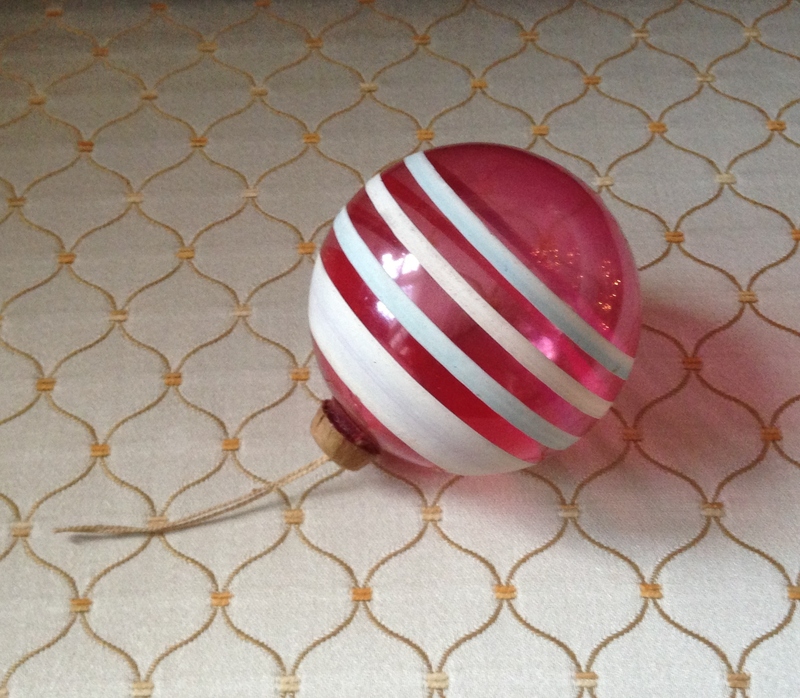 By 1939, these mass-produced American Christmas balls were available across the country in Woolworth stores. Like the one pictured above, they were typically made of brightly colored glass and decorated with stripes of opaque, lighter colored paint. Due to the absence of the silver solution, the ornaments are less sparkly than those produced pre- and post-war. This was predominately the type of ornament that hung on the little shrub-like cedar in my grandparents’ house in Kentucky in the 1950s. My grandfather and uncle usually cut down a tree from somewhere on the farm. By today’s standards of height, shape and beauty, it would not be considered a fine specimen. But to my family at the time, it looked exactly the way a Christmas tree should look. It was an ideal tree: a homegrown, local, Kentucky cedar. Certainly no one could say it didn’t have the perfect Christmas tree smell. 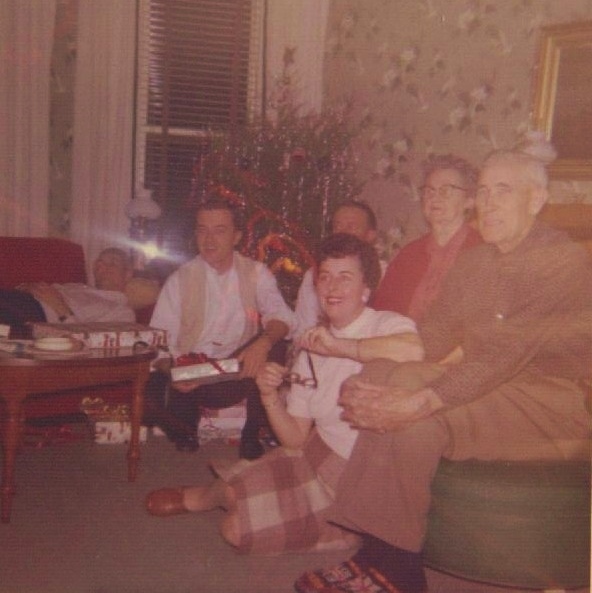 In the photo above, taken sometime after my parents’ marriage in 1955, are, from left: Uncle Bill on the sofa, Daddy, Mama, my mother’s eldest brother Leland, my grandmother, and my grandfather. 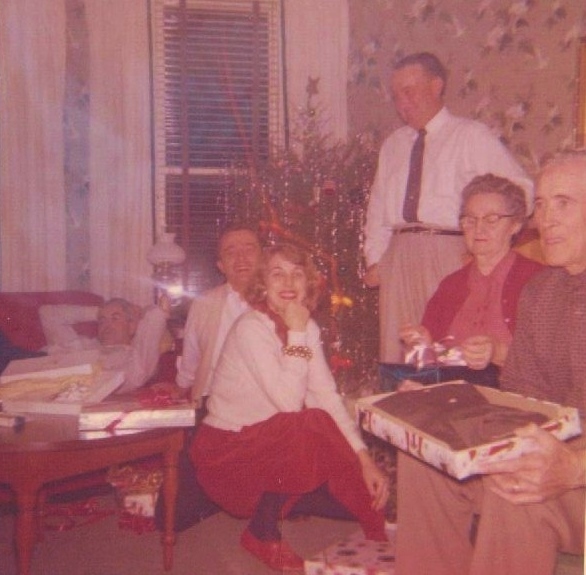 Above, Aunt Dessie, Leland’s wife, is in the center, with her husband partially visible behind. Mama must have taken this photo. When I imagine Christmas in Kentucky in the years shortly before my birth, I see these smiling faces and hear their laughter. I smell that festive cedar smell, and I wonder why anyone would ever choose a tall thin Christmas tree.